Every summer I scour New York City for tee shirts from one of my favorite local designers, Jann Chevitz of Lucky Fish. Jann finds the most stretchy-soft and perfectly fitting tees and tops and screenprints big bold graphics onto them, all just accross the bridge from me in lovely Gowanus, Brooklyn. TC loves her shirts as much as I do, and he is crazy picky about this sort of stuff. I used to find her stuff at local indie craft fairs and high end shops, but its become so popular that nobody has anything in stock for too long. Two summers ago I trekked to Williamsburg for the Renegade Craft Fair on what turned out to be the hottest day of that season, because I heard a rumor that Lucky Fish would be there. The fair was held inside what had once been a giant swimming pool, really just a big concrete dish with a reflective surface, compounding the problem of it being too hot to begin with. I felt like one of a thousand unknowing ingredients baking away in a very crafty, very large, lasagna. I started to lose it after walking through two aisles, becoming so cranky that when I reached the Etsy booth and its alarmingly perky little hostess and her greeting of "HI!! Whats YOUR favorite CRAFT?? ", I may have answered "drinking all of your water before I yak all over your mailing list clipboard". By aisle five I was in a veritable trance, which ended abruptly when someone almost knocked me over in his hurry to assist a friend, who apparently had just fainted while waiting in line at the Mr. Softee truck. Still, I pushed on. You can imagine my dissapointment at not ever finding Jann or her wonderful shirts. I came home with slight heatsroke (plus an odd sunburn on the underside of my chin) and a only a small, random, assortment of owl themed bric-a-brac, drank two mojitos with extra mint and went to bed at six thirty. This summer I wasn't taking any chances. I called Jann directly and invited myself over to her Brooklyn studio. 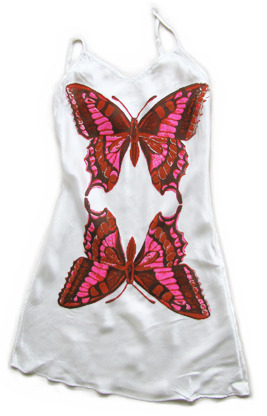 I happily bought enough tee shirts to justify interrupting her afternoon (which is a lot, this is one busy and in demand lady) including one of my most favorite designs of hers that is ALWAYS out of stock in the stores she sells to: her butterfly. I think I may have mentioned to Jann that I loved the idea of wearing the design under my little cotton blazer, to bed, etc, and wondered out loud if she had ever considered printing on silk. A few weeks later, I got an email from Jann about a special little silk chemise and camisole that she was working on for me. I convinced her to let me post it here, and to take orders from my readers. I should add that this is not, in any way, a paid endorsement. I have every intention of paying full price for my nightie. I am motivated, however, by selfishness. I firmly believe that in this age of discounters, importers, and cheap goods, we must support the designers, retailers, and manufacturers that we value in every way possible. Also I never want to spend another day wandering around the inside of an empty swimming pool looking for the perfect tee shirt. You can order a chemise (perfect for summer sleeping) or a cami (so so so great with jeans and a little cardigan) directly from Jann at Lucky Fish ( these are a special run and aren't pictured as options on her site, just tell her that you are a reader of my blog). The nightgown (or "chemise") comes in s-xl and costs $62, the cami costs $46. Both are printed by hand in Brooklyn.